Rhododendron x ‘P.J.M.’ is a broadleaf rhododendron hybrid popular in North America. It takes it’s name because it grows well in the Pennsylvania, Jersey, and Maryland region. The 1,0140 known species of Rhododendron range in size from 4 inches to 100 feet tall, with over 20,000 hybrid varieties. The P.J.M. Rhododendron is one of the most cold hearty of them all. This cross between Rhododendron carolinianum and Rhododendron dauricum var. sempervirens is the winner of the Rhododendron of the Year Award of the American Rhododendron Society for the Mid-Atlantic, North West, South Central and South East regions. The P.J.M. 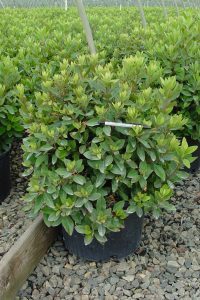 Rhododendron is a vigorous, compact, small-leaved and rounded evergreen shrub. Its evergreen leaves are dark green and glossy in the summer, rusting to a purplish-green in the fall and winter. It is densely growing plant, reaching a height and diameter of up to 5-6 feet. The bright lavender flowers bloom in clusters of 4-9 and though are an attraction to wildlife, it is worth noting that all parts of the plant are poisonous to humans if ingested. Many types of Rhododendrons like full sun, however the PJM loves partial shade. Like all Rhododendrons however, it requires moist, acidic, humusy, well-drained soil. The P.J.M. likes a pH level below 5.5, so as with all plantings, a soil test is advised. It appreciates a high amount of organic matter in the soil, and compost or decomposed pine bark can help provide that. It is paramount that these plants receive an abundant amount of water to live a long and healthy life. 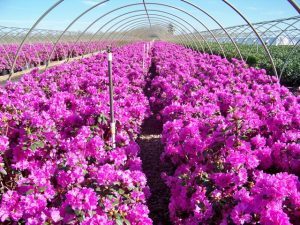 Rhododendrons are susceptible to many insect and disease problem including canker, crown rot, root rot, leaf spot, rust, powdering mildew, aphids, borers, lacebugs, mealybugs, scale, thrips, and whitefly. As long as proper care is taken to prevent these problems, the P.J.M. should thrive. 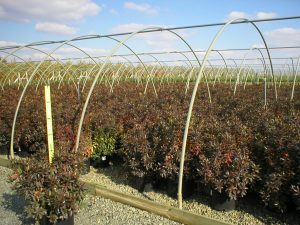 The best time to plant is in early spring or fall, the worst time would be the months of June, July, and August as the plant is actively growing at these times. To help prevent drying from the winter winds, and ideal spot for planting would be on a northeast slope or corner of a structure. When planting, the root ball should be planted several inches above the soil line. Planting below can lead to eventual plant death. The soil should be kept well drained to prevent root rot, a bark composing of 50% or more of fine pine is a helpful addition aiding in the prevention of Phytophthora root rot. Mulch should be placed no closer to the trunk than 5-6”. If planted in an area with clay-based soil, a raised bed is recommended. It attracts many varieties of birds, including and butterflies. Unfortunately, it attracts some unwanted guests as well, deer have been known to indulge in it’s leaves. The P.J.M. makes a great border plant, informal hedge, or privacy screen for a front yard or ground floor window. Though most PJM hybrids possess purple flowers, the ones with white and rosey lavender blooms are known as a PJM White Form, and PJM Lavender form. 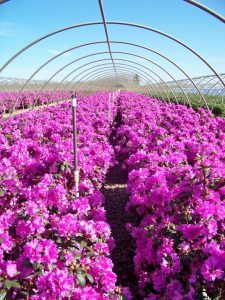 Ready to add the Rhododendron PJM to your next landscape project? Check out our container availabilities here.